What is the second half of 2012 going to bring? Are things going to get even worse than they are right now? Unfortunately, that appears more likely with each passing day. I will admit that I am extremely concerned about the second half of 2012. 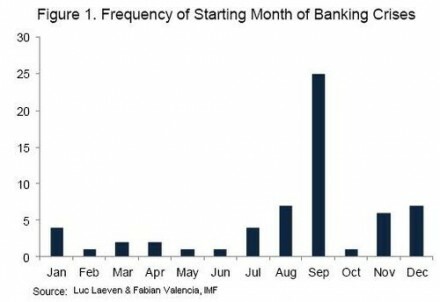 Historically, a financial crisis is much more likely to begin in the fall than during any other season of the year. Just think about it. The stock market crash of 1929 happened in the fall. "Black Monday" happened on October 19th, 1987. The financial crisis of 2008 started in the fall. There just seems to be something about the fall that brings out the worst in the financial markets. But of course there is not a stock market crash every year. So are there specific reasons why we should be extremely concerned about what is coming this year? Yes, there are. The ingredients for a "perfect storm" are slowly coming together, and in the months ahead we could very well see the next wave of the economic collapse strike. Sadly, we have never even come close to recovering from the last recession, and this next crisis might end up being even more painful than the last one. Citigroup's two-notch long-term rating downgrade from A3 to Baa2 could have led to US$500m in additional liquidity and funding demands due to derivative triggers and exchange margin requirements, according to the bank's 10Q regulatory filing at the end of the first quarter. Morgan Stanley – which Moody's downgraded from A2 to Baa1 – said a two-notch downgrade from both Moody's and Standard and Poor's could spur an additional US$6.8bn of collateral requirements in its latest 10Q. The bank did not break down its potential collateral calls under a scenario where only Moody's downgraded the bank below the Single A threshold. Royal Bank of Scotland estimated it may have to post £9bn of collateral as a result of the one-notch Moody's downgrade to Baa1 in a statement on June 21, but did not detail how much of this additional requirement was driven by margin for swaps exposures. In fact LEAP/E2020 has never seen the chronological convergence of such a series of explosive and so fundamental factors (economy, finances, geopolitical…) since 2006, the start of its work on the global systemic crisis. Logically, in our modest attempt to regularly publish a "crisis weather forecast", we must therefore give our readers a "Red Alert" because the upcoming events which are readying themselves to shake the world system next September/ October belong to this category. The Spanish financial system is basically a total nightmare at this point. Moody's recently downgraded Spanish debt to one level above junk status, and earlier this week Moody's downgraded the credit ratings of 28 major Spanish banks. The euro zone's third-biggest economy is seen as the next domino at risk of toppling after the European Union's June 9 deal to lend Spain $125 billion in bank bailout funds. Yields on Italy's 10-year government bonds reached 6.2 percent on June 13, up from just 4.8 percent in March. By pushing up Italy's borrowing costs out of fear of default, investors are making a default more likely. The main glaring risk threats that could propel Italy down the path to become Europe's next domino is the size of country's outstanding debt (at €1.9 trillion or 120% of GDP); the mountain of debt it has to roll over in the next 12 months (nearly €400 billion); and the market's cracking credibility around Prime Minister Mario Monti's ability to reduce the country's fiscal footprint and spur growth. Further, fear around Italy's creditworthiness, which has recently been expressed by near cycle highs in sovereign CDS spreads and government yields on the 10-year bond, follow some rather glaring negative fundamentals over recent quarters and years: declining GDP over the last three consecutive quarters; a rising unemployment rate (especially among its youth); deterioration in labor market competitiveness; and increased competition for export goods to its key trading partners. Merkel, speaking to a conference in Berlin today as Spain announced it would formally seek aid for its banks, dismissed "euro bonds, euro bills and European deposit insurance with joint liability and much more" as "economically wrong and counterproductive," saying that they ran against the German constitution. "It's not a bold prediction to say that in Brussels most eyes -- all eyes -- will be on Germany yet again," Merkel said. "I say quite openly: when I think of the summit on Thursday I'm concerned that once again the discussion will be far too much about all kinds of ideas for joint liability and far too little about improved oversight and structural measures." In fact, Merkel says that there will be no eurobonds "as long as I live". This means that there will be no "quick fix" for the problems that are unfolding in Europe. Every single day, hundreds of billions of dollars is being pulled out of banks in southern Europe. Much of that money is being transferred to banks in northern Europe. All over the globe the flow of credit is beginning to freeze up. In fact, the Bank for International Settlements says that worldwide lending is contracting at the fastest pacesince the financial crisis of 2008. "The city is fiscally insolvent and must seek Chapter 9 bankruptcy protection," Stockton said in a statement released yesterday after its council voted 6-1 to adopt a spending plan for operating under bankruptcy protection. It is being reported that Barack Obama is putting together an army of "thousands of lawyers" to deal with any disputes that arise over voting procedures or results. It certainly looks like this upcoming election is going to be extremely close, and there is the potential that we could end up facing another Bush v. Gore scenario where the fate of the presidency is determined in court. This campaign season is likely to be exceptionally nasty, and I fear what may happen if there is not a decisive winner on election day. The possibility of significant civil unrest is certainly there. We definitely live in "interesting" times. "It's A Depression For Millions And Millions Of Americans"
When people lose everything, they tend to get desperate. And desperate people do desperate things - especially when they are angry.